Banking on Climate Change provides you with a comprehensive, cross-jurisdictional analysis of legislative and policy responses to climate change and the financial crisis in key market economies. The climate finance field is extremely new. This qualitative study on corporate climate finance spells out the importance of private capital finance and public finance in facilitating the transition to a low-carbon economy. You’ll find a thorough discussion and analysis of the discrete topics of finance and climate change, which will help you in your lending, investing and advising activities. Megan Bowman draws upon the access she has received to senior bank managers and international workshops to explore the activities of multilateral development banks and specialized climate funds. She also considers the influences of corporate law and corporate governance norms on directors’ decision-making. She examines the risk/return theory for a range of private finance actors, and explores how business case logic and corporate social responsibility influence financial behaviors. She also looks at the case for Chinese ‘state capital’ for global green investment. Banking on Climate Change includes personal interviews with senior bank personnel, corporations and non-government organizations in the United States, Europe and Australia. This data will give you a key insight into how and why the banks make their decisions, and will be helpful for legal practitioners, policy-makers and anyone working in other private finance sectors. This ready reference work includes empirically informed regulatory recommendations that policy makers can act on straight away, helping you with quick legislative responses to climate change and the global financial crisis. The Hon. Mr Justice William Blair, High Court of Justice of England and Wales. Chapter 1 Banking on Climate Change. Chapter 2 A Unique Relationship: Private Finance Actors and Climate Change. Chapter 3 Why Do Companies Go Green? Chapter 4 The Levers of Corporate Change: Case Study Evidence. Chapter 5 The Limits of Corporate Change: Case Study Evidence. Chapter 6 Empirically Informed Regulation. Chapter 7 Re-setting the Regulatory Sights. Chapter 8 Looking to the Future: Chinese-Global Green Growth. “Human mediated climate change is the central defining dilemma of this century, and our preparedness as a society to respond, adapt, and slow the phenomenon is accordingly one of our great challenges. Financial market actors (working within and across borders) will play a critical role in this process. And yet, there has been little serious academic and policy work analyzing the efficacy and preparedness of such actors to take on the task. Megan Bowman’s contribution fills this void in an accessible, creative, and politically pertinent way. It is an indispensable must-read for anyone wishing to go beyond ‘celebrating the problem’ of global climate change, and into positing a workable set of solutions.” -Prof. Eric Talley, University of California, Berkeley. 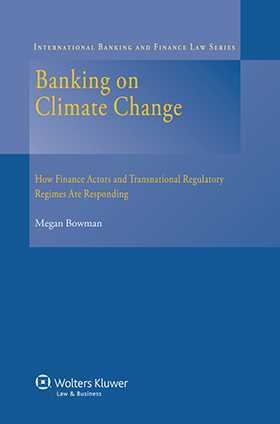 “Banking on Climate Change is an essential source of penetrating analysis for those in the policy community who want to get beyond just talking about the vital role of the financial sector in the solution to the climate problem”. -Adjunct Prof. Howard Bamsey AM, Australian National University and former Director-General of the Global Green Growth Institute (Seoul).